CSX740HSSL Canon Powershot SX740HS Silver 20.3Megapixel ..
CSX740HSBK Canon Powershot SX740HS Black 20.3Megapixel ..
EOS 5DSR Body Kit ( 50 Million Pixels ) Canon EOS 5DS ..
EOS 1DX Mark II ( 20 Million Pixels ) Canon EOS 1D X ..
CSX70HS Canon Powershot SX70HS Black 20.3Megapixel Digital ..
CANON POWERSHOT SX70HS Canon Powershot SX70HS Black ..
CANON EOS 80D VIDEOGRAPHER KIT Canon EOS 80D 25.80 Megapixel ..
CANON EOS 800D DOUBLE IS BUNDLE Canon EOS 800D Double ..
What to look for when buying a digital camera. Are "pixels" all that important? How to take quality pictures using your digital camera. How to ensure that your batteries will not run out on you at the crucial moment. How to select the right resolution and compression. What is the storage capacity of the digital camera? How to take care of your lenses. Do you need a flash? The most critical element in a digital camera is the lens because all light must travel through the lens. Choose from traditional film camera makers, especially those renowned for their optical lens. Consider what type of storage media the digital camera uses. Other devices such as printers and digital projectors also use the same removable storage memory cards, so images stored can be output straight away in these devices. Select compatible devices. Is pixel count all that important? In digital cameras, the film is replaced by a small sensor chip - either CCD (charged Coupled Device) or CMOS (Complementary Metal Oxide Semiconductor) - which captures the image in a digital format. The CCD (or CMOS) sensor surface is divided into tiny squares called pixels, and each pixel captures one segment of an image. The more pixels a sensor has, the more details it can capture and store. While it's true that the number of pixels a CCD contains is an excellent measure of the detail the digital camera can capture, this is not always the case. Picture quality doesn't necessarily improve with another million pixels. Features such as lens, the colour filter used on the sensor, and the digital image processor also play an important role in determining picture quality. 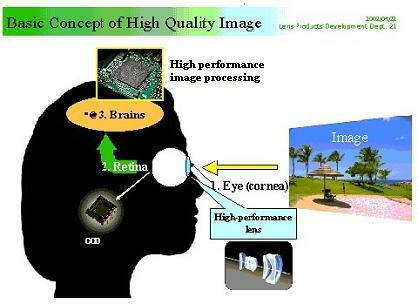 Compare the digital camera to the human eye and brain here. To capture an image, light first travels through the lens. It is gathered as electrical charges by the sensor. The sensor, by itself, is incapable of perceiving colours, so it obtains colour data by means of a colour filter arranged above individual pixels. Image data gathered by the sensor is converted into digital signals, which is analysed and processed by the image processor which then gets written out onto a memory card. It is recommended that you purchase a digital camera with a built-in flash for night shots. Use the camera's exposure compensation mode if there is too much light in the background. Use long-life lithium batteries, which may cost twice as much, but will last three times longer. Use rechargeable Nickel Cadmium (NiCd) or, preferably, Nickel metal hydride (NiMH) batteries. Buy a second backup battery. Consider a rechargeable, plug-in camera battery pack with longer power time. Use the camera's optical viewfinder whenever possible, unless your camera doesn't have one. The LCD screen is handy for reviewing shots, but they can drain batteries in less than 20 minutes. If you are shopping for a camera, consider getting a traditional optical viewfinder as well as an LCD viewfinder. Turn your camera off between shots. Resolution is the measurement of an image size in pixels. Since the maximum available resolution of an image is constantly increasing, digital cameras use a process known as "compression" to reduce the data size of the image before it is stored. While this increases the number of pictures you can store on each memory card, there is a trade off in quality. The table on this page has a guide on resolutions and print sizes. The storage capacity depends on the memory space of the removable storage media, and also depends on the resolution and the compression of the images. Click here to view a guide on storage capacity. Dirt, dust and fingerprints impact the performance of your lens. And believe it or not, there is a right way and a wrong way to clean a lens. Do it right and you'll maintain peak optical performance. Do it wrong and you could scratch an expensive piece of photographic equipment. This page contains details on the correct procedure of cleaning your digital camera lens here. Always consider a flash. Built-in flashes typically produce harsh shadows and edges, unnatural skin tones and "flat", washed-out images. So when using electronic flashes, don't use it head on. Instead, diffuse the flash using various accessories such as bounce cards or soft boxes, or aimed to reflect from other surfaces, also known as "bounce flash".